I've never been fond of female metal, probably a bit macho side of me I confess, but this cd is interesting. First it's nice to see the packaging and the graphics suit the music very well, original and abstract it's all good, and much better than all the covers with a zoom on the face of the singer ( ) About the content, blood pig is without a doubt the key track of the album, efficiently agressive and enoughly varied as well, it will hook you very fast. The rest is not bad but definitely a step behind, the only bad point is that crappy rap singing on some of the tracks, who doesn't have anything to do here. 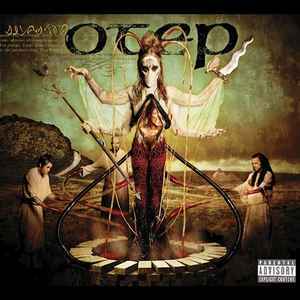 I don't know the plan of otep about it, but this wasn't the thing to do, the structure is a bit broken and it affects the seriousness of the general mood as well. Of course mostly tracks here are very depressed, with a lot of howls, anger etc..., the usual "crazyrock" thing in one word. If my memory works well, Marilyn Manson himself had congratulated her about that first album, I just hope Otep won't get bad with time, since that sad path seem to be the rule especially for that kind of artists (I mean who release very agressive music). The whole thing deserves some attention anyway.